I can remember the day just like it was yesterday. October 6, 1956 was a clear, crisp, sunny day that I had been awaiting anxiously for several weeks. I had been told that on that day, I would get to attend a college football game with my dad, Hoyt Buffington, uncle Ray Williamson and my cousin Tom Williamson. Tom had been an outstanding tackle for the Dragons before his graduation from Jefferson in 1953. He always bragged that it was his blocking that sprang Jefferson legend Don Cole for many of his touchdown runs for the Dragons during the 1952-53 seasons. I was an eleven year-old fifth grader. My home room teacher was a petite young lady named Mrs. Harrington. She was a gem of a teacher, like many that I was fortunate enough to be associated with during my Jefferson elementary, middle school and high school years. Future Class of 1964 cronies in my class were guys like Buck Tolbert, Thomas Bond, John Davis. Jr. and Johnny Pruitt. Some of my young lady classmates were Susan Ethridge, Posy Storey, Julia Stovall and Gloria Spence. Just a group of kids tied together by fate and happen-stance as we all started to school together in 1952. 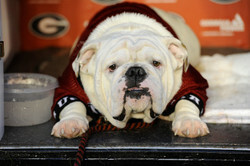 The Georgia Bulldogs were playing the Mississippi State Maroons at 1:00 p.m. in Sanford Stadium that Saturday. I tried to picture in my mind just what a college football stadium would look like compared to Jefferson Memorial Stadium. I had seen video shots of Sanford Stadium as I watched the Georgia game replays on Sunday evenings after a Saturday game, but I had never been able to see the entire stadium. I never came close in my mind to the vast difference in a college stadium and a high school stadium until I made my way into Sanford Stadium on that beautiful day in 1956. I don't know if there has ever been a bigger Georgia Bulldog fan than my dad. He and the Williamson's would attend many games over the years in Athens, while I never thought much about going to a game until I started attending the Jefferson Dragons games in 1955. That's when my addiction to football began. I had learned earlier that Tom and his dad had plans to attend the first Bulldog home game versus Florida State ( Georgia would win the game 3 - 0 on a late 43-yard field goal by Ken Cooper. ) in a couple of weeks so I started my campaigning for making the trip to the home game after that game. It was my dad who told me a few days later that he was going with them to the game. He asked me if I wanted to go? I managed to contain my excitement somewhat as I casually told him I did want to go with them. I was really tickled to death . . . I couldn't wait to tell my best friend, Johnny Pruitt, that I was going to the Georgia - Mississippi State game. Little did I realize that the youg man playing quarterback for the Bulldogs that day would wind up being a good friend of mine for many years during the early 70s through the mid-90s. Billy Hearn was the Bulldog quarterback that day. I well remember that # 10 along with other Bulldogs of the day like, halfback Carl Manning, fullback and Captain Knox Culpepper, Sr., Flanker Jimmy Orr and Kicker/end Ken Cooper. Billy Hearn and I became friends as members of the Northeast Georgia Basketball Officials Association. We must have called over 200 games together over the 28 years I officiated high school basketball. He lived just outside Winder, on the Braselton highway. Billy would come through Jefferson, pick me up, and we would go to Hart County, Stephens County, Gainesville Jr. College and many other places all over Northeast Georgia to referee games on a Tuesday, Friday or Saturday night. Billy Hearn was probably the best official I ever called a game with in over 28 years of high school officiating. He took me on a tour of his Winder business, Southeastern Waistband, and I later reciprocated by taking him on a tour of my Gold Kist, Athens Poultry processing operation. I'm going to take a few moments to tell you a little bit about Billy Hearn. A tribute to Billy Hearn . . .
William Waller Hearn, Jr. was born June 22, 1936, to Tiny Hearn and Stella “Nana” Weglicki Hearn. During that time, Tiny ( A Georgia Tech basketball star in college ) was still competing in the American Basketball League for Kingston, New York. Billy grew up in beautiful Eatonton, Georgia, the home of his father. In 1954, he graduated from Putnam County High School with honors. Like his father, Billy was a tremendous, multi-sport athlete, excelling in football, baseball, and basketball. Young Billy began garnering serious attention for his athletic talents; and upon graduation, he received multiple offers to play professional baseball along with extensive recruitments from numerous major college programs. After considering options for his future, he decided to forgo professional baseball and attend college at the other member of the “Rivalry of Clean, Old-Fashioned Hate,” the most heated rival of his father’s alma mater: the University of Georgia. In Athens, just as Tiny had done on the Flats, Billy became a star athlete. By the time of his graduation, he would letter in three sports, the last Dawg to accomplish such a feat. Billy Hearn lettered as a baseball player from 1956-1958. Baseball was arguably Billy’s most successful sport as a Bulldog despite suffering a major shoulder injury in the fall of 1956; the young phenom posted a 12-5 record as a pitcher for the Dawgs while maintaining an incredible 3.19 career ERA. One of his greatest performances came in his final season on the diamond. Hearn was the starting pitcher for UGA when the Dawgs battled the North Carolina Tar Heels in the championship game of the Rollins Round Robin baseball tournament. According to an article from the March 23, 1958 issue of The Daily Tar Heel, UGA and UNC were deadlocked at 2-2 entering the eighth inning of the contest when the Bulldogs tallied five runs and emerged victorious, 7-2. Hearn was recognized as the winning pitcher, surrendering only seven hits for the ballgame while allowing just two runs. Young Hearn also lettered in football for the Bulldogs in both the 1956 and 1957 seasons under legendary head coach Wallace Butts. His most successful season occurred in 1956, in which he experienced some memorable moments in the red and black. Hearn was voted Most Valuable Offensive Back on the football team that season. He started at quarterback and defensive back for the Dawgs, wearing number 10. Though the forward pass had developed tremendously in the landscape of football when compared to the early 20th century, rushing still dwarfed passing as the major source of offensive output for football teams. Nonetheless, Hearn still tallied solid statistics under center. Out of 61 pass attempts for the season, a total which many teams surpass in just one game in modern football, he completed 26 passes for 294 yards, one touchdown and six interceptions. Perhaps the most noteworthy moment of his career occurred on September 22, 1956, when the Bulldogs hosted the Florida State Seminoles in a defensive battle of epic proportions. The two teams each finished the game with 55 offensive plays for 214 yards exactly. Deadlocked in the fourth quarter, the Seminoles began to threaten with a drive led by none other than ESPN’s legendary College Gameday analyst, Lee Corso. Corso marched the Seminoles from their own 17 yard line to midfield after a series of pitchouts and an 11-yard scramble. However, on the next play, Corso would be outmatched by fellow quarterback and defensive back William Waller Hearn, Jr. Corso launched a pass toward tight end Ronnie Schomberger when Hearn leapt and intercepted the ball from Schomberger’s hands. Billy began to march the Dawgs downfield, completing a clutch 10-yard pass in the process. However, the drive stalled, and Georgia was forced to attempt a 43-yard field goal, the longest attempt in Sanford Stadium history at that time. Kicker Ken Cooper clinched victory for UGA by nailing the field goal, and the Bulldogs survived by a 3-0 score, improving to a 2-1 record on the season. Billy Hearn will forever be a part of the storied rivalry that Georgia shares with Auburn University as well. The Bulldogs and Tigers were competing at Memorial Stadium in Columbus, in 1956 when a dirty, first quarter hit sent the two sides into a frenzy. Hearn dropped back to pass and was injured by a bone-crushing hit by a tandem of Auburn defenders Jerry Wilson and Tim Baker; he was forced to leave the game with a badly separated shoulder. On the next play, backup quarterback Ken Schulte heaved a pass downfield that was intercepted by Auburn at the 5 yard line. Meanwhile, at the line of scrimmage, an intense fistfight had broken out between Tim Baker and UGA offensive lineman Harold Deen Cook concerning the previous play. The brawl cleared both benches along with coaches, police officers and a few spectators. The fight had become impossible to extinguish until the Auburn band was instructed to spontaneously perform the National Anthem. The players immediately stopped throwing punches and returned to the sidelines out of respect for their country. Oh, how such patriotism and respect is missing from football today. Yet another fight broke out in the third quarter, and the violence of 1956’s contest completely overshadowed a 20-0 victory for Auburn. In the midst of all of the ruckus, Billy Hearn was sidelined with an injury too severe to be calculated at the time. Unfortunately, his fears would be confirmed, for Billy, a once touted baseball prospect, was never the same after that fateful day at Memorial Stadium. His professional baseball hopes had been diminished. Neverthless, William Waller Hearn, Jr. is a proud son of the city of Eatonton, and he is dearly missed. He passd away on July 13, 2006 after a heart attack. He continued a legacy that had begun with his father, Tiny, and he provided the good people of Eatonton with countless memories. The star for the Mississippi State Maroons in 1956 ( They changed their name to Bulldogs at the start of the 1960 season) was also a quarterback. Billy Stacy was an All-SEC defensive back and all-around performer for the MSU Maroons. He would complete 32 of 71 pass attempts for 464 yards and 3 Touchdowns, while rushing 138 times for 613 yards during the 1956 season. He also intercepted 4 passes for the Maroon defense. Stacy was drafted in the first round, ( the third player taken ) by the Chicago Cardinals after his senior season. He became an All-Pro safety with the Chicago/St. Louis Cardinals. Another interesting aspect of this game was the introduction of the real, live UGA I . . . the Georgia Bulldog mascot. There were live bulldogs used as mascots in the past, but this was the first time the UGA name was attached to an official Bulldog mascot. The Bulldogs were defeated 19 - 7 on that October day. This was the last time that Mississippi State defeated the Bulldogs of Georgia in Athens. I don't remember how I felt after that loss. I don't think I was as emotional over the winner-loser of a football game ( Georgia would finish with a 3 - 6 - 1 record, while Mississippi State would finish 4 - 6 ) during those days of my life as I am now when the Bulldogs or my beloved Jefferson Dragons take it on their chin. I believe the thrill of seeing a college football game at Sanford Stadium was enough to counter any sadness for the loss on that particular day. Now the Bulldogs and Mississippi State kick off again in Athens. I don't think I'll attend the game. Best seat in the house is in front of my television. You can bet I'll watch the game and the memories of October 6, 1956 will come back strong. This is one of those memories that will live with me forever. It was a first for me and the first time you build a lasting memory, it seems to almost come back around at some point in your life. The Dawgs need a win Saturday in a big way. The Georgia-Mississippi State game final outcome didn't much matter to an eleven year-old kid back in 1956. It does matter to a just turned 72 year-old Bulldog fan in Jefferson, Georgia in September of 2017. The name UGA was introduced as the official name of the Georgia mascot at the 1956 Mississippi State - Georgia game in Sanford Stadium on October 6. Bulldog fans view the game from the railroad tracks that ran behind the stadium. Tackle Tony Cushenberry was the Bulldog's only All-SEC selection in 1956. 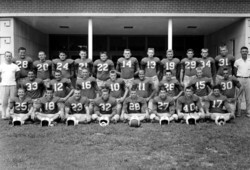 The 1956 Georgia Bulldog quarterbacks, halfbacks and fullbacks. Jimmy Orr was honorable mention All-SEC in 1956. He went on to star in the NFL as a wide receiver with the Baltimore Colts. Georgia Bulldogs uniforms through the years. 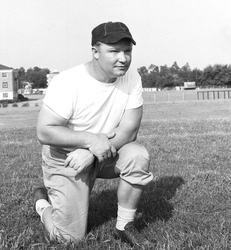 Coach Wally Butts completed his 18th season as Coach of the Georgia Bulldogs in 1956. 1956 Bulldog quarterback Billy Hearn # 10. Fullback Theron Sapp. The man that would break the drought, ( eight consecutive losses to Georgia Tech,) in 1957 was a back-up fullback in 1956. Carl Manning # 34, Bulldog starting right halfback, goes after his own fumble in a 1956 game. Manning was the leading rusher for the 1956 Bulldogs with 398 yards on 83 carries. Sanford Stadium in 2017 with a 94,000 seat capacity. Nick Chubb will carry much of the Bulldogs hopes when Mississippi State comes to Athens on September 23. 2017.
in Athens for a battle of the Bulldogs. Stay tuned! . . .